This book contains a) the first Devanagari edition of the Kasyapaparivarta the unique Sanskrit manuscript of which (supposedly written sometime in the 7th or 8th century CE in Khotan) was discovered more than a hundred years ago in Eastern Turkestan, and b) an English translation of this text. The Kasyapaparivarta must have been highly esteemed, for there exist several Chinese versions and one Tibetan translation of it. It can be argued with good reason that, together with the oldest textual strata of the Astasahasrika-Prajnaparamita those of the Kasyapaparivarta constitute a specimen of the earliest Mahayana literature. A study of the present text reveals that it must have inspired the compilers of further Mahayana discourses and, moreover, become one of the basic sources for the chief Madhyamika and Yogacara masters who both rather substantially quote from and often allude to it. The main themes of the text are the bodhisattva ideal and the teaching of sunyata, 'emptiness', both being the key features of the Great Vehicle. Thus there are indeed a few passages in the text where, vis-a-vis a bodhisattva, a disciple of the 'Lesser Vehicle' is criticised for being self-interested. On the other hand the Sravakayanist arhat is clearly associated with the insight and wisdom of svabhvasunyata. Due to the fact that already in the Pali canon proto- Madhyamika thought is traceable, it can be maintained that in large part in the Kasyapaparivarta Mahayana ethics and Sravakayanist wisdom/prajna of the Great Vehicle in the making harmoniously coexist. As obtainable from the edition of the present text, in terms of Buddhist Hybrid Sanskrit linguistics and prosody, it is an almost inexhaustible mine of information. 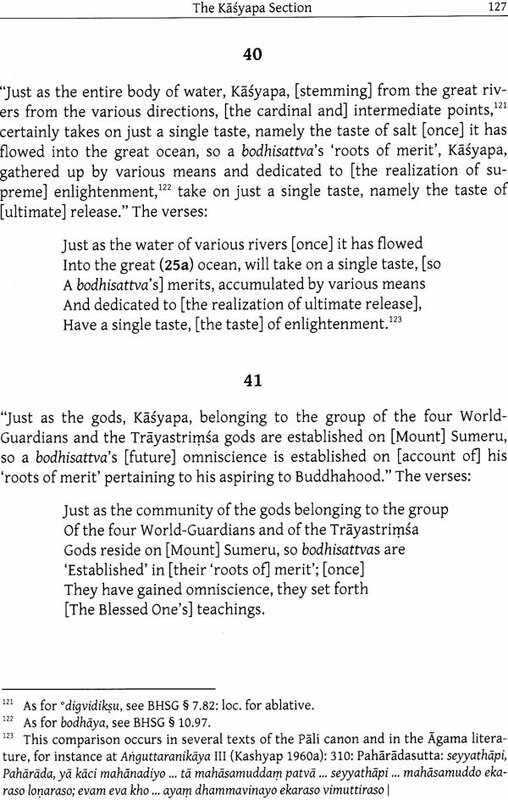 In the notes to the English translation are given, with reference to a considerable number of passages in the Devanagari edition, details about possible antecedents in Pali texts or classical Mahayana discourses whose compilers most likely were inspired by the Kasyapaparivarta available to them. Bhikkhu Pasadika (b. 1939) received his academic education in India (Nalanda Pali Institute in the early 60s, Punjabi University Patiala in the early 70s of the last century). From 1975- 77 he was reader in the Punjabi University Patiala, teaching Pali and German. He edited the quarterly Linh-Son - publication d'etudes bouddhologiques at Joinville-le-Pont (Paris) from 1978-82. Then, until 1993, he participated in the project Sanskrit Dictionary of the Buddhist Texts from the Turfan Finds of the Commission of Buddhist Studies, Academy of Sciences, Goettingen. From 1995-2007 he was hon. professor, Dept. of Indology and Tibetology of Philipp's University Marburg, teaching Pali, Sanskrit, classical Tibetan and Buddhist Chinese. Additionally, he was in charge of the chair of Indology at Wuerzburg University (1996-2000). He also was visiting professor at Ruhr University Bochum. He has been specialising in early Mahayana literature and in Sravakayanist Nikaya-Agama comparative studies. 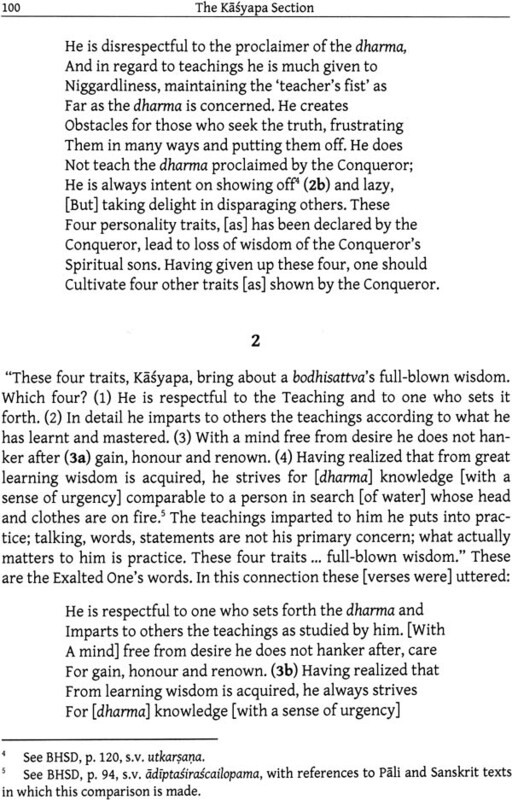 Among his publications may be mentioned, for example, Vimalakininirdesasutra, Tibetan Version, Sanskrit Retranslation (based on his PhD dissertation), Hindi Translation - in collaboration with Lal Mani Joshi, Sarnath/Varanasi, 1981; Kanonische Zitate aus dem Abhidharmakoiabhiisya des Vasubandhu, Goettingen, 1989; Nagarjuna's Sutrasamuccaya: A Critical Edition of the mDo kun las btus pa, Copenhagen, 1989. The KP is surely one of the earliest Mahayana discourses whose edition and transliteration in Roman script are fairly well-known, whilst this seminal text has as yet never been published in Devanagari characters. For many years it has been my intention to prepare a Devanagarl edition of the KP and to revise thoroughly an earlier English translation of mine. In the following some remarks are made about its attempted realization. Both the KP edition and transliteration in Roman script are based on a unique Sanskrit manuscript kept in the St. Petersburg Branch of the Institute of Oriental Studies, viz. the MS "SI P/2". This manuscript, written in Brahmi script, was brought to Russia from Eastern Turkestan at the end of the 19th century; a number of lacunae apart, it is nearly complete and may have been written in Khotan sometime in the 7th or 8th century CE. In 1926 von Stael-Holstein published his edition of the KP together with its corresponding Tibetan translation and four Chinese renderings presupposing more or less different versions of the original Sanskrit. Again, in 2002, the Romanized text of the MS "SI P/2" was brought out by Vorobyova- Desyatovskaya in collaboration with Karashima and Kudo. As Vorobyova- Desyatovskaya states, when comparing the MS "SI P/2" with some other fragments of the KP, belonging to the Central Asian MS collections of the UK, Finland and Germany, the conclusion can be safely drawn that "at least two Sanskrit versions of the KP existed in Eastern Turkestan in the first centuries CE: a brief and apparently earlier version, and an extended one which took shape later. The MS 'SI P/2' represents the extended version" of our text. Whereas von Stael-Holstein refers to his Romanized text as 'edition', Vorobyova-Desyatovskaya calls hers a 'transliteration'. When comparing both scholars' dealing with the MS "SI P/2" with the help of the perfectly legible (apart from illegible, omitted, lost, erased or damaged aksaras or parts of aksaras) facsimiles published at the end of Vorobyova-Desyatov- skaya's Romanized text, von Stael-Holstein's can in fact be considered an edition even though he does not give footnotes, and Vorobyova-Desyatov-skaya's a very careful transliteration with full notes bearing on difficult readings, proposed emendations, parallel readings found in the other KP fragments, as mentioned, and scribal errors. It should be stated here that von Stael-Holstein had, apart from his informative preface with notes, actually planned to publish numerous notes to his edition in a separate volume which, however, never saw the light of day. In his edition he indicates, of course, the punctuation marks occurring in the MS and missing aksaras or parts of aksaras, but he also makes 'improvements' to the Sanskrit text e.g. by inserting aksaras lost because of damage to the Sanskrit text, but without specifying the insertions. Another editorial procedure of von Stael-Holstein is his normalizing a peculiar spelling not infrequently found in the MS, viz. the doubling of the subscribed -r, e.g. krr, grr, prr etc., a way of writing 'said to have been influenced by the Khotanese'; see Vorobyova- Desyatovskaya (her transliteration, p. 3, n. 1) who, throughout, transliterates the double -r spellings. It goes without saying that such spelling would prove rather awkward for converting it into Devanagari script. For the sake of ready comprehensibility in the present Devanagari edition of the KP both spelling and punctuation have been standardized to some extent.' Where lacunae in the MS occur, reconstructed words or aksaras are indicated by italics, and likewise text, lost in the MS, that has been preserved in KP quotations and drawn upon to fill large lacunae. As in von Stael-Holstein's edition, a division of the Devanagari text into paragraphs or sections according to its contents seems preferable to Vorobyova-Desyatovskaya's textual arrangement foliowise. Hers is a meticulous presentation of MS data ('handschriftlicher Befund'), while in its arrangement sectionwise the Devanagari text should match that of the English translation following it in order to facilitate its study. Since in Vorobyova- Desyatovskaya's presentation of the Romanized KP text all textual and scribal peculiarities, special features of punctuation, numbers occurring in the MS or the position of string holes are already given and since this Romanized text is widely accessible, in the Devanagari edition these items are not considered. In view of the special features of the Devanagari script it has not proved practicable to indicate most of the MS data as in Voroby- ova-Desyatovskaya who has pointed out all missing, superfluous or reconstructed aksaras or parts of aksaras by means of various types of brackets and italics. As for textual passages or even missing folios that have been reconstructed tentatively, i.e. 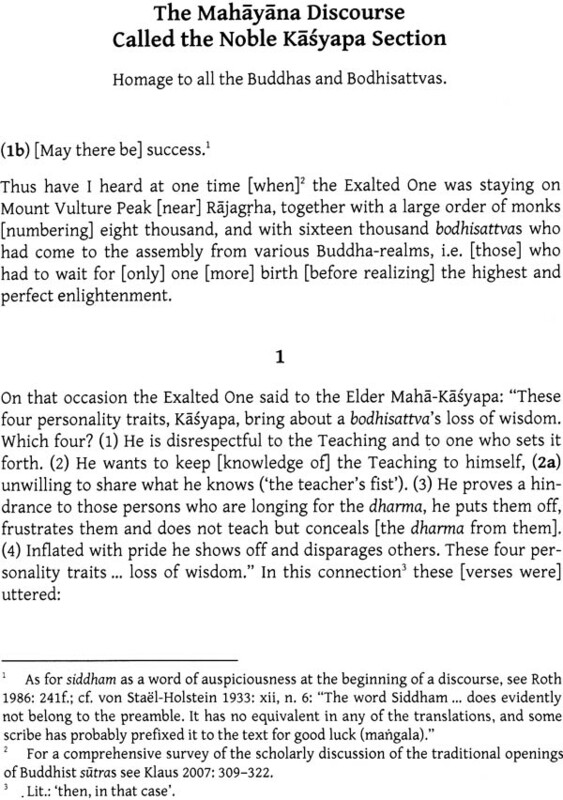 retranslated ex hypothesi from the corresponding Tibetan version of the text, all such retranslations are again given in italics.' 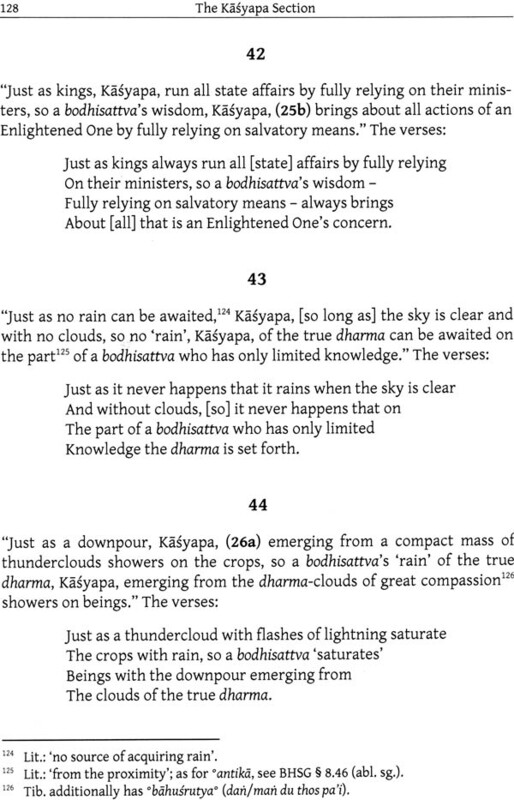 Although tentative reconstructions of missing text in Buddhist Sanskrit discourses or treatises may seem to be superfluous when translating such works, for example, into English, they are certainly justifiable for the purpose of facilitating envisaged future renderings of texts such as the KP into modern Indian languages. 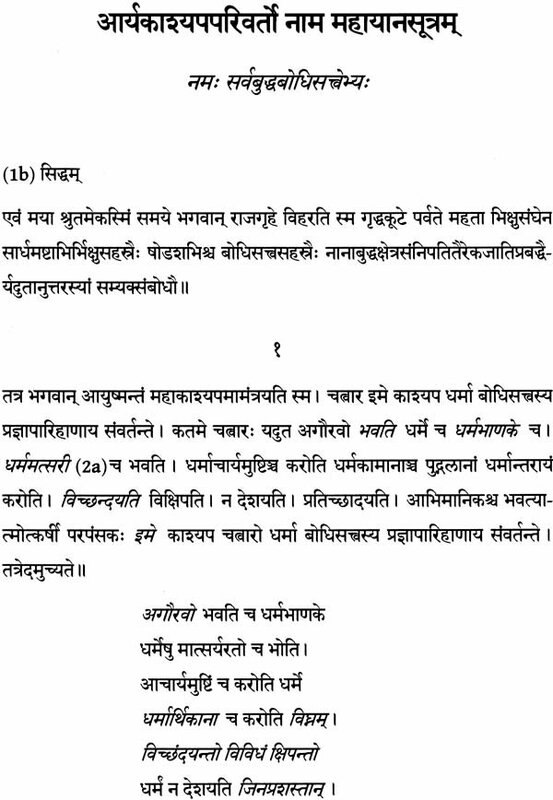 On the whole also the Devanagari edition should represent the Buddhist Hybrid Sanskrit' text as it has come down to us in the unique MS from Central Asia. To enhance its comprehensibility, as said, 'standardized' readings are given in the KP text it- self. BHS and non-standardized forms are considered in the notes to the KP translation. Although the text's verse parts play an important role, this is not the place to treat the knotty problems attaching to the verses' origins, to their linguistic shape (BHS features vs. scribal idiosyncrasies or blundering) or metric/hypermetric structures. A special discussion of the KP verses would probably require a separate publication.' Furthermore, text- critical remarks, emendations or reconstructions by Weller 1965/Pasadika 1977-79 referred to by Vorobyova-Desyatovsakya in her notes are often tacitly taken into account but not repeated in the present edition. Newly proposed emendations/reconstructions are referred to in the notes to the KP translation; such have become possible thanks to the MS facsimiles provided in Vorobyova-Desyatovskaya 2002 and with the help of the most useful palaeographic charts in Sander 1968. For the sake of completeness I had planned before to provide, in an appendix at the end of the present edition, further MS fragments of the KP in Devanagari script, viz. the MS fragment "SI P/85A" (St. Petersburg), the fragments in the Hoernle and Mannerheim Collections (London, Helsinki), the fragment in the Turfan Collection (Berlin) (see Vorobyova-Desyatov- skaya 2002, pp. 58-64) and a new one made accessible in Karashima 2009. 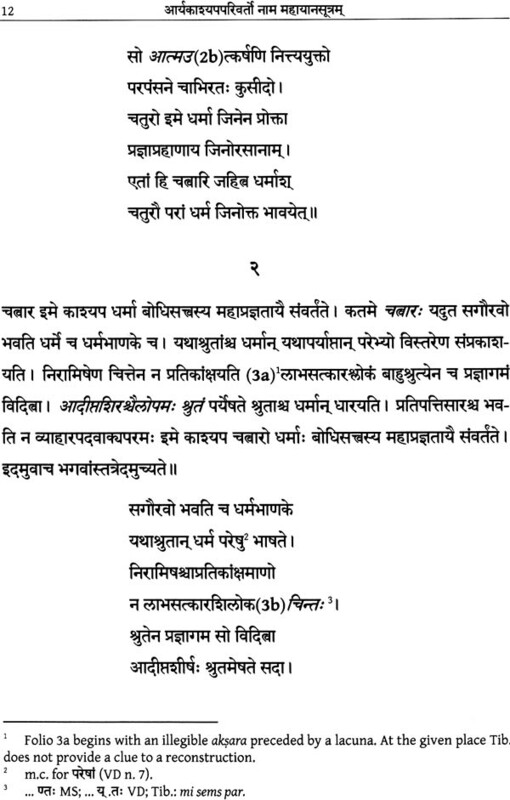 Since these fragments are readily available, as listed in the bibliography, it may be more useful to survey in the following re which KP sections, for readings/passages to fill lacunae, which of the above-mentioned fragments and KP quotations in later Mahayana texts have been drawn upon in the Devanagari edition in order to facilitate the reading of the BHS text.